I don’t understand why it has not been integrated as it represents only 2 lines of code to be modified. So I decided to patch my ZendServer to measure the gains and compare to AMFPhp. 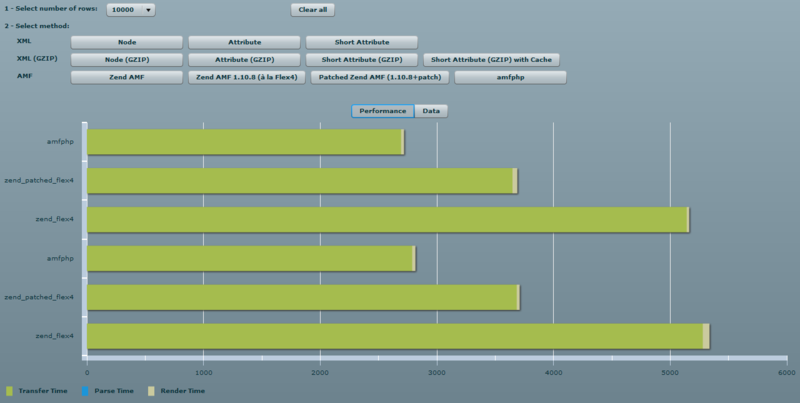 For that, I used the excellent comparison tool provided - with sources - by PhilFlash. This is actually the only independant, objective and clear tool that I found on the web to compare the performance of ZendAMF and AMFPhp (+ gzipped XML transfers which are even faster than AMFPhp). So here is my results showing the performance gains obtained on my laptop as Apache/MySQL server (you can check in the comments of the issue 7493 that some guys found more important gains). So just on my laptop, the patch makes ZendAMF’s performances closer to those of AMFPhp.